"I love you, a thousand times over. And I will never apologize for it." First off, this book has been on my TBR pile since the first day I saw the cover on the internet. Never mind the premise, it was the cover which drew me in. Having now read the book, I'm happy to say that sometimes you can judge a book by its cover and not be disappointed. 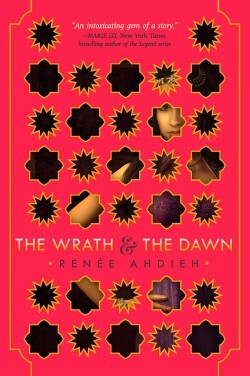 Inspired by 1001 Arabian Nights, The Wrath & The Dawn follows Shahrzad when she volunteers herself to the be the most recent bride for the murderous boy-king Khalid. Every night Khalid takes a new bride, and every morning he has her killed. After Shahrzad's best friend Shiva becomes one in a growing list of murdered girls, she vows to avenge her by killing Khalid herself. In order to stave off her impending death on the night of her wedding she begins to tell her husband a story, a story which she draws to a cliff hanger as the dawn's light creeps through the latticed window screens. The next night Shazi picks up the story where she left off, weaving a lengthy inner story, which mirrors quite a bit of the tensions and relationships between Khalid and Shazi. While I do think Shahrzad could have, and maybe should have spent more time trying to fulfill her promise of vengeance, my not so inner fangirl was delighted to watch the relationship between Khalid and Shazi develop from the cold disinterest and hatred, to the awkward sort of friendship they held at the end of book one. Lyrically told, and packed with an excellent cast of secondary characters, The Wrath & The Dawn blends magic, mundane, and storytelling to present a book that lived up to its media promise. Definitely looking forward to book two, The Dagger & The Rose; hopefully it builds even further with the brief glimpse of magic book one gave.